Digital video cameras offer a convenient way to record memorable moments with family and friends in high definition video. Easy to operate and lightweight, camcorders allow you to record life’s important moments in motion picture and share with others those unforgettable times. Hard Disk (HDD): The most storage capacity of all camcorders. Internal memory ranges up to 250GB, plus there's a memory card slot. Hybrid models allow recording to the internal hard drive and on a removable flash memory card (SD, SDHC, or Memory Stick). Flash Drive: Often referred to as "solid state", flash drives are compact and light. With fewer moving parts than HDD, a flash drive is durable and shockproof. The most portable (smallest and lightest) cameras on the market. Hybrid models: Offer both internal and removable flash memory card storage. Mini DVD: Record directly to a small DVD, which you can play (in a DVD player) immediately. Removable flash memory cards offer extra storage capacity. 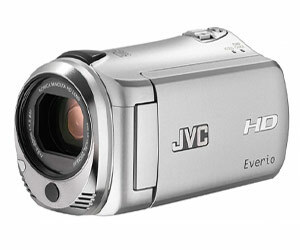 Some hybrid camcorders allow you to record video footage and still photography separately on the hard drives. SD and SDHC: Most common flash cards, which can be used across a number of devices — e.g. video cameras, compact cameras, DSLR and computers. Memory Stick: Exclusive to Sony applications. Capacity: Measured in Gigabytes (GB). More capacity equals more footage. High Definition (HD) cameras shoot video in a higher resolution than Standard Definition (SD), resulting in a clearer picture from a HD camera. HD will play on a widescreen digital TV with minimal loss of picture quality. HD won't lose quality when copied to DVDs etc. Recording in HD takes up more storage capacity, but changing picture and audio quality settings saves storage space. HD is more expensive, but the price gap is decreasing. 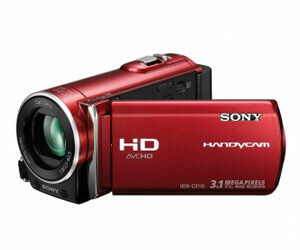 Automatic settings like focus, audio and colour balance make shooting on a digital video camera a breeze. Use the camcorder's flip-out display screen to compose the shot. Most camcorder LCD screens are between 2.5 and 3.5 inches (measured diagonally). Some models offer touch-screen control and menu selection for ease of use. Most camcorders come with a USB cable to connect with digital devices. Connect to a television or monitor using a 'Video Out' cable or HMDI connection to display what the camera is recording. Some TVs, DVD players and most laptops come with an SD card reader to load directly from the card. Adapters can connect Sony Memory Sticks with USB 2.0-capable devices. Some multi-function SD cards double as USB sticks, making them connectable to almost anything. Zoom lets you shoot a close picture of a distant object. Optical zoom retains image quality because it uses the lens itself. Digital zoom reduces picture quality because it is a digital enhancement of the image. What Is The Image Sensor? A camcorder's image sensor transforms light (captured by the lens) into a digital signal, which is then stored as a digital video file. Look for a high pixel count and a physically larger image sensor, or multiple sensors. The two types of image sensors are CCD (Charged Coupled Device) and CMOS (complementary metal-oxide semiconductor). CMOS uses less battery power. Sony's EXMOR (CMOS) image sensor is more sensitive, meaning it can record in lower light levels. OIS reduces the shakes and bumps that occur in hand-held camera footage by varying the optical path to the sensor. This technology is implemented in the lens itself, rather than in the digital camera, making it a more compact technology. A microphone with zoom or an enabled Bluetooth wireless microphone will help record audio from a distance. Camcorders come with a standard battery and charger, but it makes sense to get at least one extra battery. The video camera will indicate when your battery is running low. Most batteries are also available in higher capacities, compared with the ones supplied. Face Detection: Automatically focuses on faces that appear in the frame, no matter where they are. Some video camera models will focus on up to 20 different faces in one frame. Some face detection systems allow you to focus on, and follow, one particular face in a crowd. Sort through your videos by face in the index for easy reference. GPS: Some digital video cameras offer GPS, which is complemented by NAVTEQ digital maps. This allows users to "geotag" the location of specific photos and video clips, so they know exactly where the footage was shot. Type: HDD for more storage space or Flash for more portability. HD or SD: High Definition (HD) offers superior picture quality over Standard Definition (SD), especially when viewed on large widescreen TVs. Connecting: An HDMI cable will connect some cameras to a digital TV. Some TVs, laptops and DVD players also have memory card slots. Most video cameras come standard with USB2.0 or composite AV connectivity as an output.